From what i understand simple turn shoes are the way forward. Maybe roman ish sandles. WIth felted socks. or Naalbinding sock. Viking sea boots are way out. There are very few examples of migration period shoes. But please some one prove me wrong! I don't think he's posted on here for a while, but maybe he'll see this and add some more detailed information. I certainly do! Mainz Calcei boots from Sarah Juniper to be exact. Remains of shoes are very rare in English graves -- those at Sutton Hoo are very posh and are turn shoes. However, I suspect that these are 'indoor' shoes rather than military ones -- there are quite a few reasons to believe that people tended to be buried in their formal, yet comfortable clothing for their final appearance in public before being covered in their tombs. Therefore, I feel that military, late Roman shoes are quite justified. Hobnails stop sliding about on grass, etc and the heavier boot provides good protection form the rigours of battle. There is almost no evidence for hobnails in AS graves, nevertheless, the Old English were not stupid and would not have wanted to experience slippage during critical moments, and so, I feel that their use is justified. The Anglo-Saxons certainly had the technology to build such shoes and make the nails! What is "viking sea boots"? It's not an archeological term, is it? 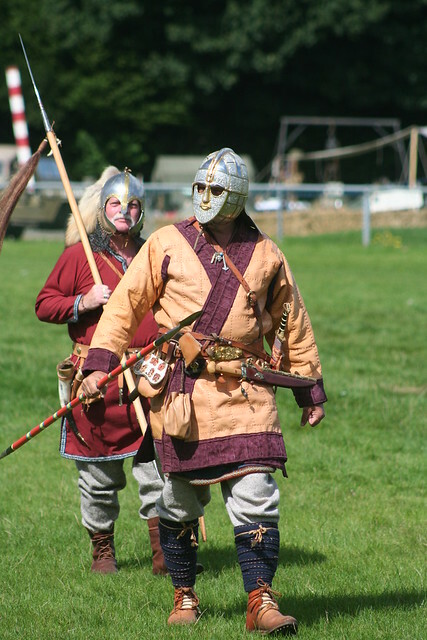 'Sea Boots' is a term used by some Viking Age re-enactors, and is probably a re-enactorism with as far as I am aware no real provenance in a maritime context. Essentially think along the lines of the boots used by Russ-Steppe-Slav re-enactors but slightly lower down the calf. From my own experiance I have found it betterto wear no shoes at all when working on viking age vessels, or tar painted soles with impregnated sand to give some surface purchase on damp timbers. Period shoes are a vexing issue with the direct paucity of archeological finds from this period, especially as Paul has said concencerning Early A-S footwear and as far as I know this is also reflected on the Continent and Scandinavia for the period we are discussing on this thread. There is if I recall correctly some provenenace for hobnails, from one of the 'princely' graves from Krefeld Gellup , but these are a bit earlier, but does show that hobnailed boots where at least known amongst the pan germanic milieu, and no doubt worn by feodarti troops...but did the use of such shoes continue in use can't be said with absolute certainty. Another answer could be the iron age shoes often found in bog deposits, certainly there use has continued in some form right up to the modern age, but turn shoes do appear to be the way forward for now....but as anyone who has ever worn turn shoes on damp grass knows they can prove to be risky! so there is nothing solid in this time, make it a bit hard but also leave a fair bit of room for some guessing and approximation. Judging by Iron Age/ Migration Era bog finds I would say that simple, single piece hide moccasins constituded the footwear of choice among northern Germanic peoples. 'Wayland's Work: Anglo-Saxon Art, Myth & Material Culture from the 4th to 7th Century' which is available direct from Anglo-Saxon Books or via Amazon Books etc. Here are a few recommendations for the title drawn from Anglo-Saxon Book's own website. Drawing on British and European publications this important book brings together the evidence for Early Medieval material culture. Well written with excellent illustrations it should be read by everyone with a serious interest in this fascinating period. The heading of Section IV, 'Wondrous Works', can well be applied as a description to this book - it is a wondrous work that will long be referred to as a ready source of information for the 300 years under consideration. I use an extra pair of thin svine leather soles on my shoes and I don't find any problems moving around on either grass or on the ship. I don't think that shoes were a matter of class. Leather is cheap and anyone can make a simple turn shoe. Most likely shoes were worn by all during the whole season. I would imagine workers and peasants in the summer might not have bothered with shoes, if only for the sake of saving on the wear and tear, and because bare feet are a sure grip. I too can't imagine shoes to be overly expensive for the reasons posted above. Hide and leather would be available wherever animals were slaughtered. Rigsthula mentions, if I remember correctly, that the wife of the son of the mythological proto-rock-bottom-class couple walked barefoot. The notion that leather is a status material is a modern way of thinking. Leather was never expensive. It covered the animals and the animals were food and labor. Why would you want a leather garment? Everything points to the fact that people wore textile. Leather was a material for the poor. Leather garments was most likely used only for special purposes (such as sealskin for seafaring). The notion that leather is a status material is a modern way of thinking. Leather was never expensive. It covered the animals and the animals were food and labor. Why would you want a leather garment? I think the main thing is that it is not the hide that would be expensive - but working it so that it it is supple and rot-resistant is not that a simple process. I have a few friends who are tanning hides and try to replicate appropriate late iron age processes involved, and as they say, getting the desirable result - specific parameters you want, is not all that easy. So it is also likely not all that cheap, just like any other skilled labour. So I would say that thick leather, usefull for making the lamellar as it was done in certain eastern areas, would have been rather expensive prospect, especially, considering the differences in climate - as far as I am aware, leather lamellar is far more characteristic to arid areas. Does anyone know if there are any online resources dealing with the splint greaves and bracer? My library is with friends in America and I am in Russia and I'm looking for some documentation but all my searches just keep bringing me back to this thread. It's possible I'm not looking in the right language but my command of other languages isn't up to snuff for finding the proper stuff. I am having some trouble finding places online where I can get merovingian age and late Vendel period items. Everything from brooches to weaponry such as javelins. I suppose commissioning is the best way to get what one wants, but I'm afraid it might prove stressful on my budget. On the other hand I'm not very keen on cutting corners.